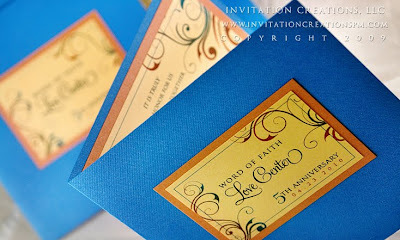 So, I have to say I was so honored that Word of Faith Love Center contacted ME to create something different for their 5th anniversary annual dinner. The First Lady and the Pastor have come to be big fans of my work and I was so honored when they thought of me for this project! We decided on custom square booklet with a seal on the cover. Inside we had a picture of Pastor Garmon and First Lady Lisa Garmon. On the other side we had special words from the Pastor. 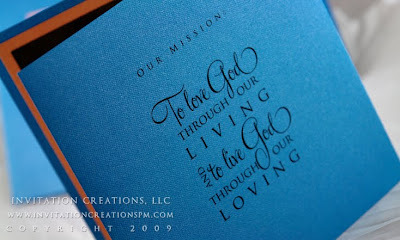 We completed the back by printing the church's mission statement "To love God through our living and to live God through our loving." 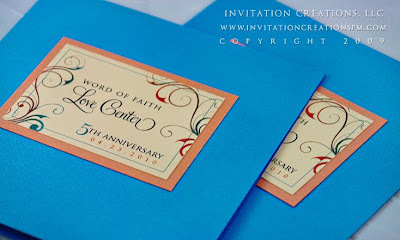 Though I love creating invitations, it was also nice to do something a little different. On a personal note, Pastor Garmon is a true man of God. He inspires me to be a better person. He sets a great example for his congregation and am proud to call him my Pastor. Thanks to Word of Faith Love Center for this opportunity and honor they bestowed onto me.